Recently I restored a Mahogany mirror frame dating to the mid 19th century. The eliptical shaped mirror is set in a carved stand which would be set on top of a chest of drawers. 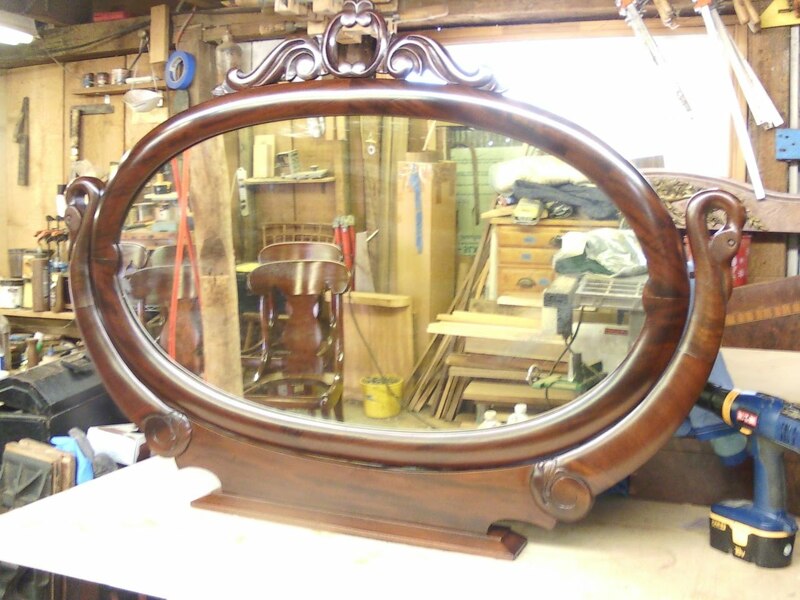 It is possible that this mirror could date a little earlier since Mahogany had fallen out of use by the Victorian cabinetmakers in favor of Walnut at this time. In addition, the stores of Cuban and Honduran Mahogany were heavily depleted through constant harvesting in previous decades. 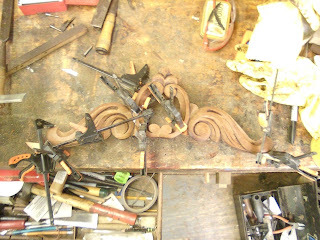 The reason I dated this piece when I did was that the carving was very reminiscent of Mid-Victorian furniture. 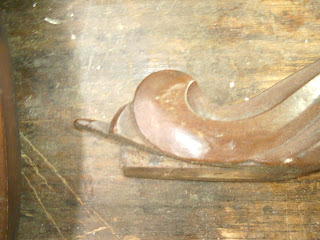 At first, I thought this piece might be English, however closer inspection uncovered that this piece is definitely American. 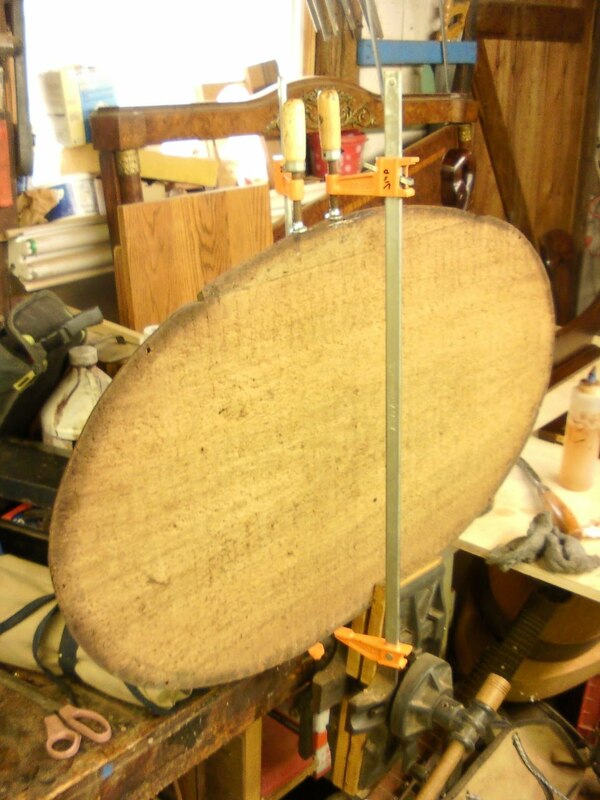 American Cherry was used as a secondary wood to make the basic structure of the mirror frame and stand. 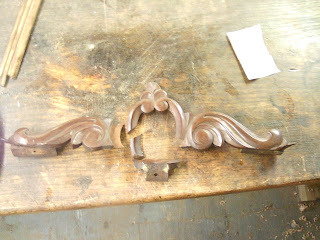 1/2 inch pieces of Mahogany were then laid over the Cherry frame and carved down. In addition, the backing for the mirror frame was made from Tulip Poplar. The mirror had some structural problems as well as some broken and missing carving. 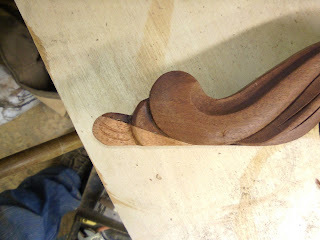 The other main concern with this piece was that it had been refinished in the past with a Lacquer finish. The problem with Lacquer is that over time it loses its transparency and also takes on a yellow haze, giving the Mahogany frame the appearance of Walnut! Lacquer is also a very static finish and lacks the elasticity of a French Polish, so as the wood moves beneath the finish, tiny fissures appear in the finish and can cause problems when cleaning products are used, and generally looks weathered. 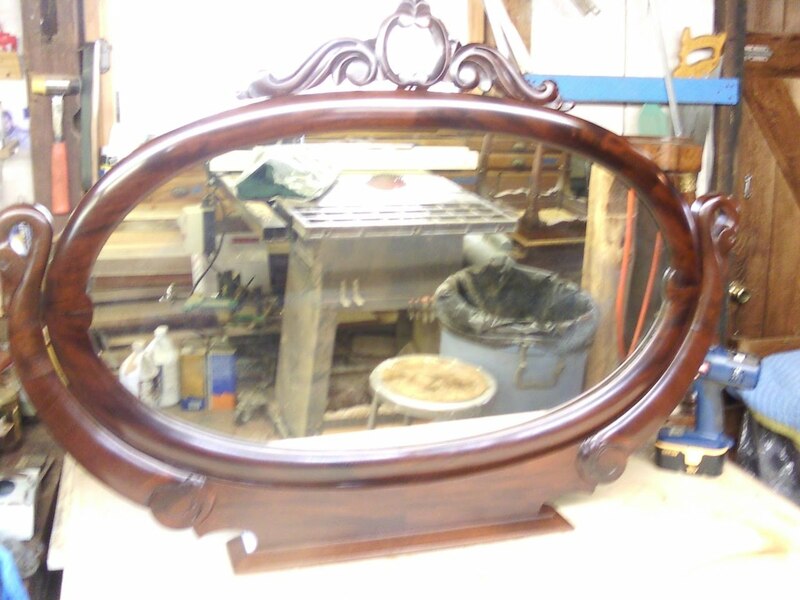 With all of this in mind the customer and I decided to remove the finish from the mirror and let the beauty of the Mahogany shine through a nice French Polish. 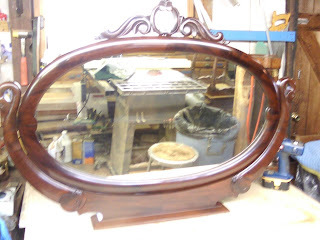 I didn't get a good "before" photo of the piece, but below are some photos of the mirror and frame and the stand as they came to me disassembled. Here is a close-up photo of the Lacquer finish. 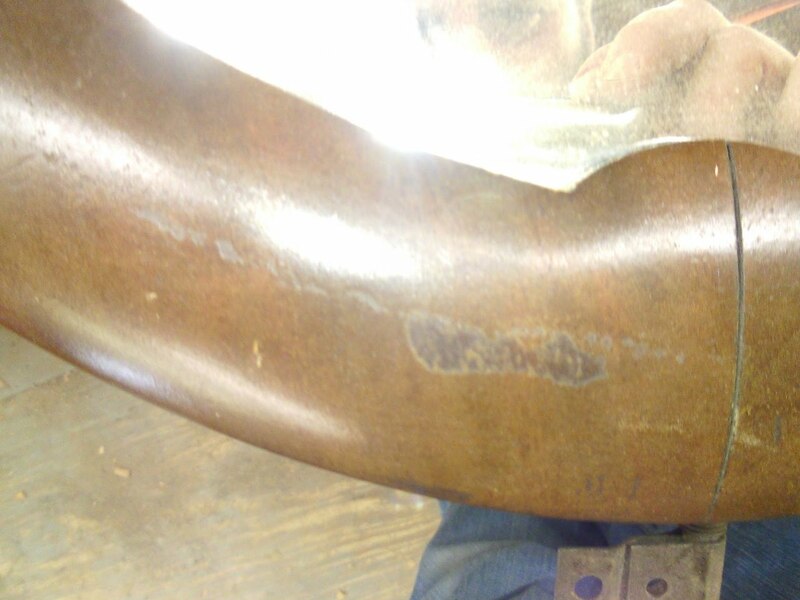 If you look closely you can see a darker area where the finish had come off. 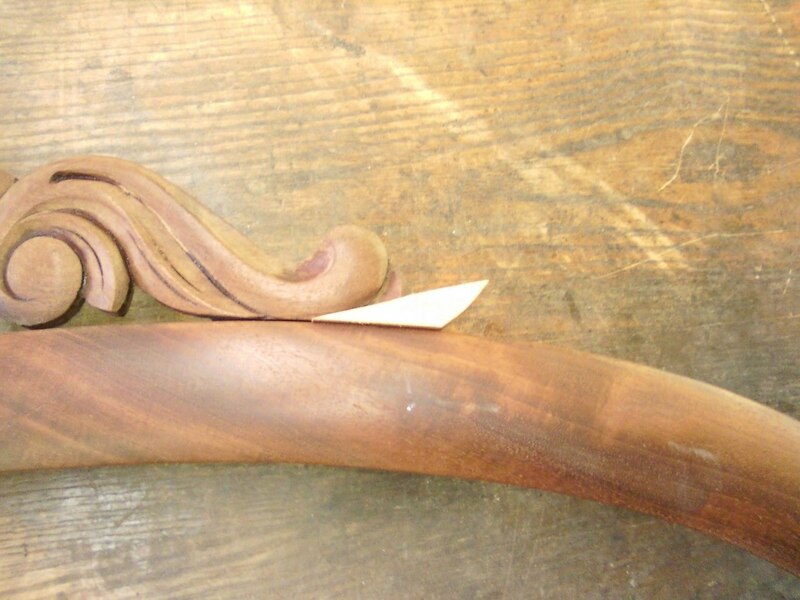 This is the natural color of the Mahogany. the yellowish hue is a result of the Lacquer breaking down. After the finish was removed, I set about repairing the frame. 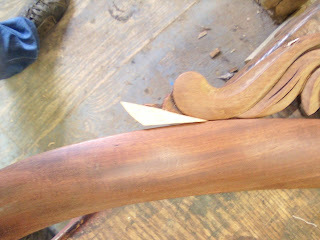 Here is a photo of the joinery of the frame being glued in place. This photo is a close-up of the photo above. 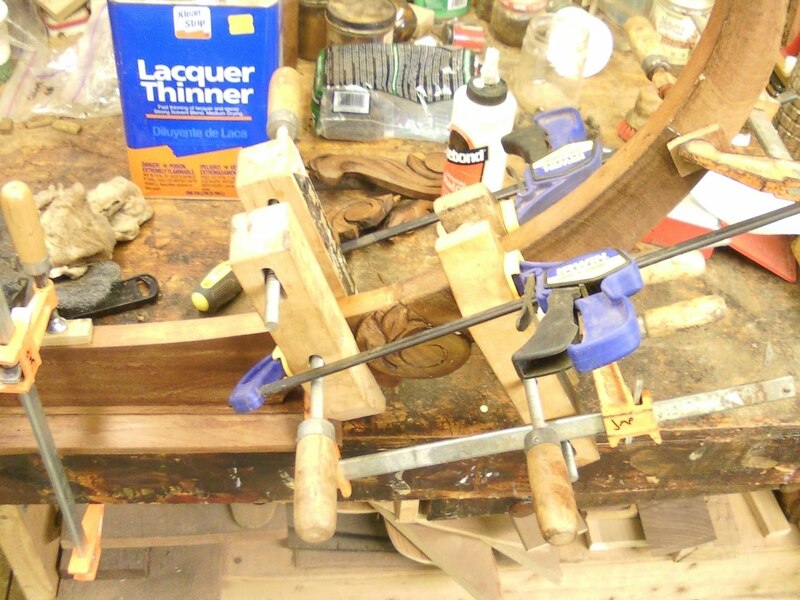 Sometimes you have to be creative with your clamping. 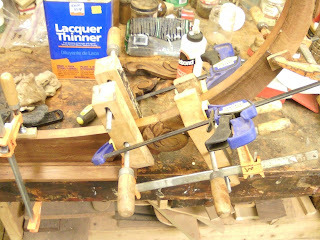 In this case I used two wooden clamps as something for the other clamps to grab a hold of. The blue clamps in the photo then drew the joint together. The piece in the photos below is a decorative carving which is attached to the mirror frame at the top. 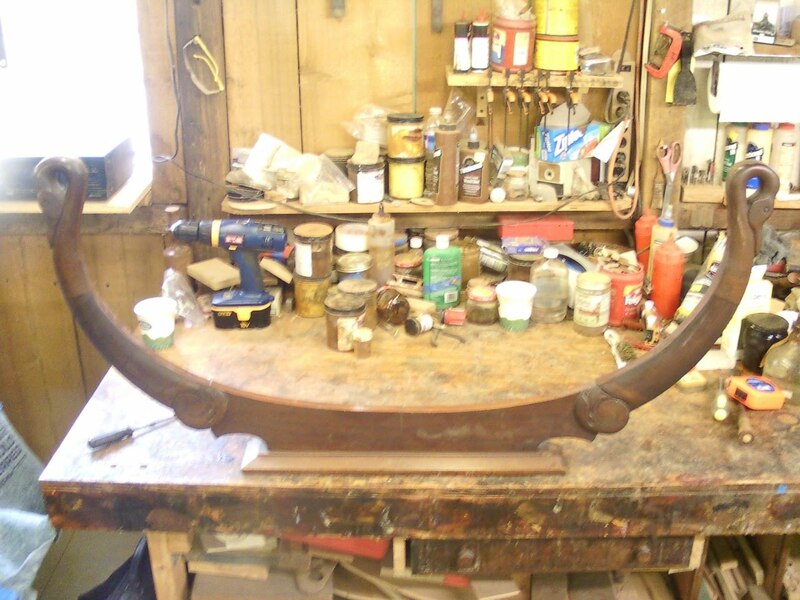 It is actually made up of several different pieces of wood which were glued together. 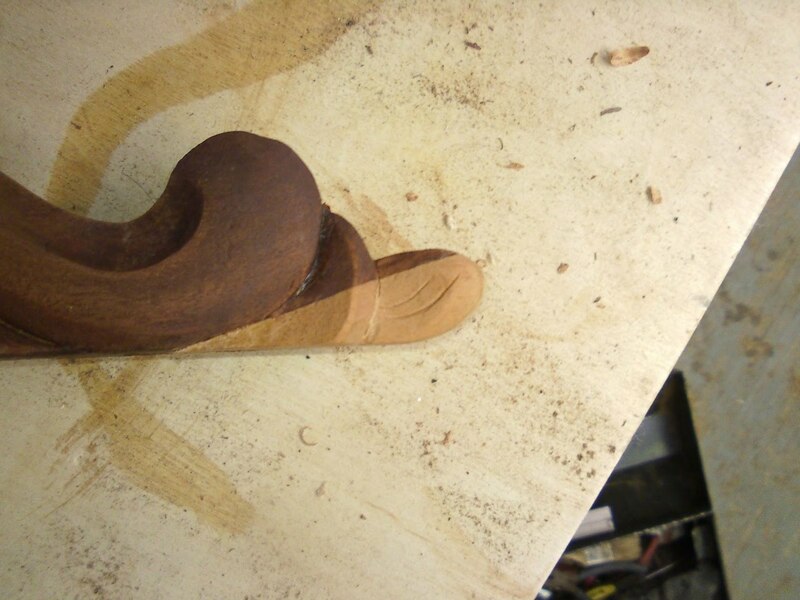 I guess the reason for making it out of multiple pieces was to make the carving easier. 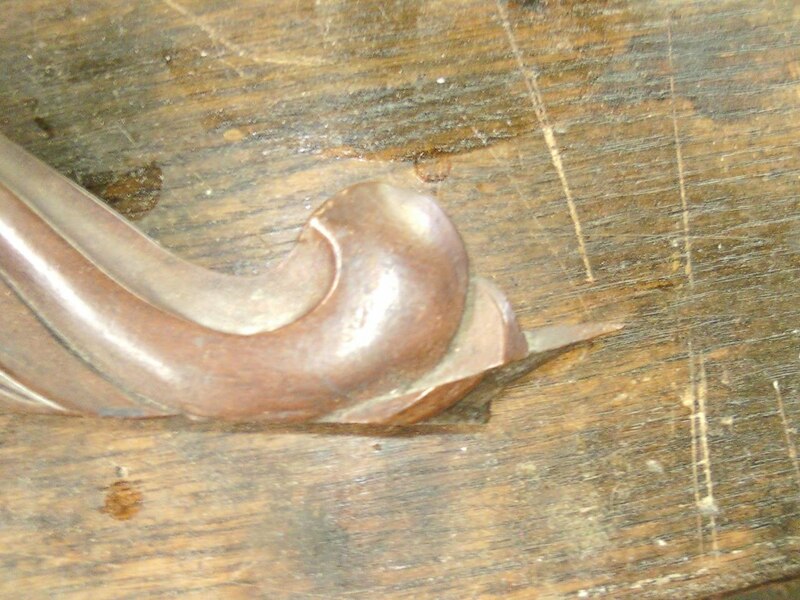 At any rate, it had broken into many pieces and had also lost portions of the carving. 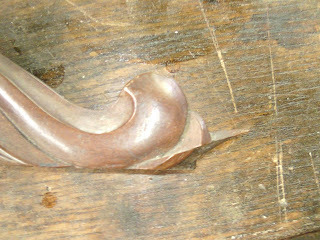 The next two photos show the carving with the finish removed and being repaired. As stated before, the carving was missing two sections, one on each end. 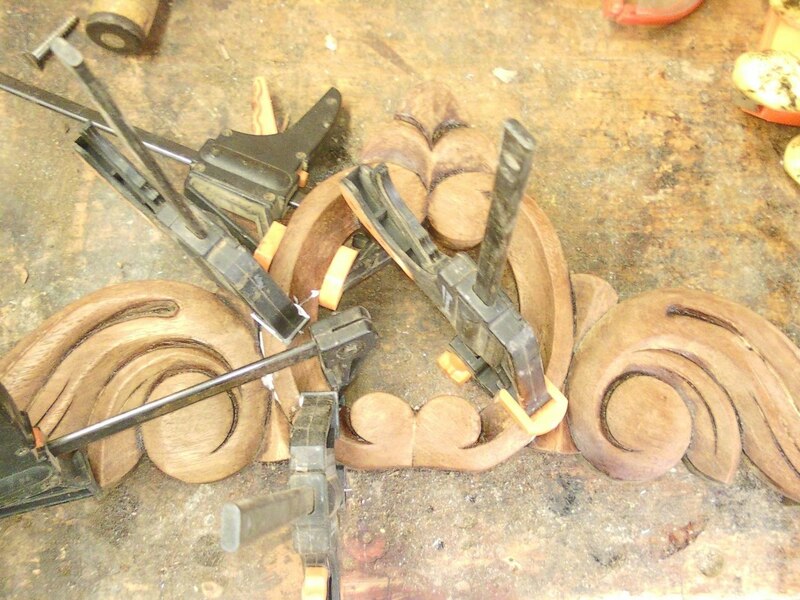 Below are some photos of the carving with the missing section, the patches put in place, and the patches carved down. The new carvings were later stained to match the color of the mirror. This photo shows a simple repair to the mirror backing. 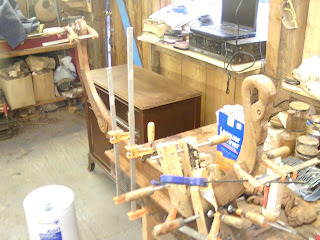 The next two shots are of the mirror frame, stand, and carving during the finishing process. 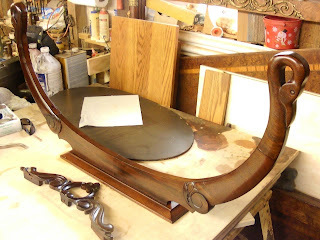 All of the pieces were selectively stained to match the darkest portion of the mirror frame. 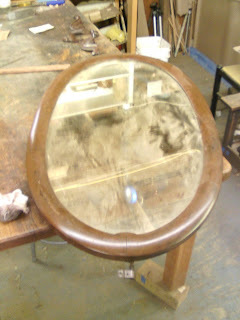 These last two photos show the mirror completed and re-assembled. 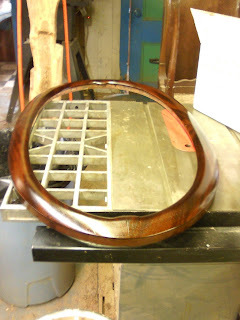 It was nice that this frame also contained the original glass, and that it was in such nice shape. 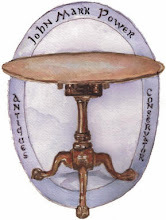 Overall this is a nice example of Mid-Victorian Furniture.